It took a bit of work to put this together, so I thought I’d share it with the community. 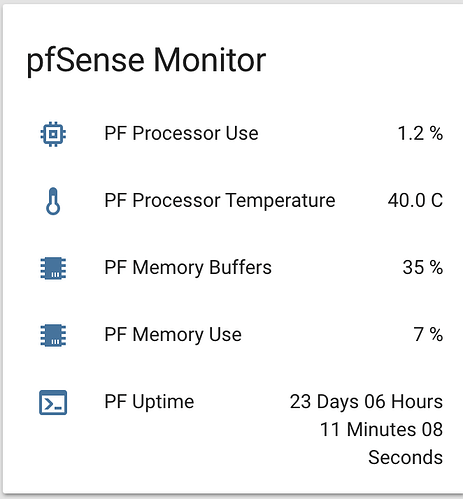 pfSense does not have a native API for pulling/pushing information, but with a little work you can get it to send stats to HA and you can also send commands to your pfSense router if you so desire. Be careful, this API is quite powerful. Make sure you don’t mess something up. <apikey_value> and <apisecret_value> may have alphanumeric chars ONLY! you must not use the sample key/secret in the credentials.ini since they are hard coded to fail. As you can see. I got rid of all the calls I wasn’t interested in and just kept the system_stats call. I also am dumping the JSON data into a file in my config directory (another directory could also be used if desired. Set up sensors in config.yaml. command: "python3 /config/pffa_get_system_stats.py <_host_> <apikey_value> <apisecret_value>"
Make sure your quote charaters are correct. Sometimes they copy over wrong. Replace <host> with the internal IP of your pfSense router (ie. 192.168.1.1). Add a group with your new sensors. They should update every minute. I tried to install the package in pfsense but a get a ssl error when I run fetch https://raw.githubusercontent.com/ndejong/pfsense_fauxapi/master/package/pfSense-pkg-FauxAPI-1.3_1.txz in ssh. Hrm. Just tried mine, did a copy and paste and it downloaded no problem. How are you attempting this? SSH? Or from the web GUI (Diagnostics>Command Prompt)? Also tried it on another FreeBSD box… worked no problem there too. Ofc ip/api/value is another (just for this post). created /home/homeassistant/config and I’m not really sure if it’s supposed to be like that, also created /home/homeassistant/client-libs/python which I placed fauxapi_lib.py (unchanged file). Not sure why it can’t find the library, or where should it be placed, am I going about this wrong? The insecure requests warning that you are getting is because your using SSL (https) to connect to a url that has an self signed certificate. This is normal and expected. 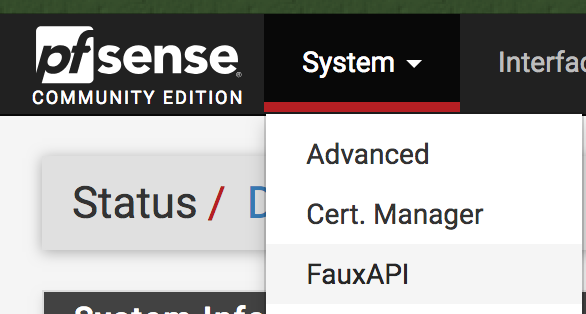 Pfsense by default uses a self-signed certificate for the encrypted connection. You are being warned because your machine isn’t sure that the information passed can be trusted, but since this is your machine you know that you can trust it. I can’t remember doing anything to prevent this warning. Maybe the library takes care of this? I can’t remember. How are you running HA? In my example, I am using hassio on a raspberry pi. It looks like your running things a bit differently and it looks like your python script is not finding the library file. Are they in the same directory? Maybe there are permission issues on the library file? What does your HA config entry look like for the sensor? I worked on that for several days, didn’t get it to work. It’s running esxi/debian/container. Oh well I tried it; didn’t work. I could not get the python script to work. I’m using hassio on ubuntu 18.04 on top unraid. What I ended doing was to write a bash script to accomplish the same thing. It can be found here. Thank you for the hard work. command: "python3 /config/pffa_get_system_stats.py 192.168.1.1 PFFArandomalphanumeric902 abcdefghijklmnopqrstuvwxyz1234567890abcde"
Got that fixed. Now I got this.I’m missing a file? The sensors loaded but no data. Maybe a firewall issue? Hrm… What version of HASS are you running? I’m using HASSIO. If you put the pffa_get_system_stats.py in your /config directory, you need to make sure that the file structure is the same when running the python command: Meaning that your ‘config’ directory is in your root directory… Does this make sense. In windows, this would look like c:/config. If you are running on raspbian or something the file structure is different. Also, I noticed in the code that you pasted you had the default apikey_value and apisecret_values pasted in there. You can’t use the defaults, they are hardcoded to fail out for security reasons. You may have just put those in there as examples to share back here in the forum, but if you’re actually using them you need to change them to something else. I do not have that file. Where is it? Sorry I’m new to this. Ya I just pasted the default keys and secret. Did not want to show mine. Python script is in the second link, but you need the python library as well. Sorry, I forgot that I changed the name of mine because I deleted everything but the system stats. I didn’t want anyother information. Here is my simplified version of python-lib-iterate.py. 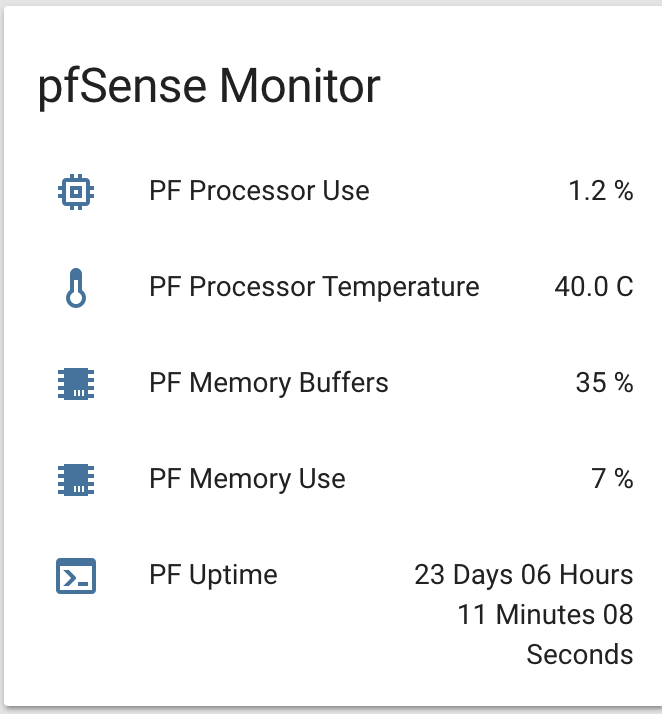 With this, you obviously won’t be able to POST anything to pfSense. Just read the system stats. You can also limit this through permissions on the pfSense PFFA side. Hi this is great thanks. 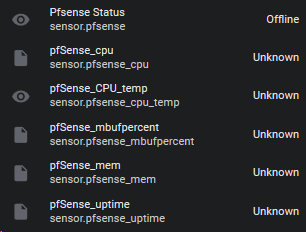 Got most of it running but for some reason can only get it to display the CPU temp, the rest state “entity not available” but if I look at the json file I see it is loading the stats for the the other sensors. If I remove it all from the card under unused entities it is only showing the CPU temp. Any chance anybody has an idea what could be the issue? Sounds like your sensors aren’t setup correctly. If the json file looks right, take another look at your sensor config in your configuration.yaml. Oh and did you look for them in your https://[IP]:8123/dev-state ? It sounds like you just tried loading them into Lovelace. You could have just had a typo or something and lovelace doesn’t see them. they weren’t there in the dev-states, but rechecked the logs and issue was the dir wasn’t whitelisted.